Choices, choices, choices...old fashioned favorites, new treats, chocolates, hard candy, seasonal; all delicious! Bates Nut Farm ships our products boxed in shredded paper for insulation and stability. 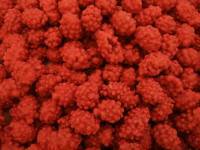 Our food products are stored in refrigerated or air conditioned environments prior to shipping. We cannot guarantee that your package travels in the same temperature controlled environment. We do not recommend shipping chocolates during the hot summer months. Description: 6 oz. - Almonds coated with sweet and crunchy coconut, just like a macaroon. Yummy! Description: Jordan Almonds are a wedding tradition. 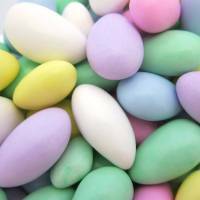 Our candy coated almonds come in an assortment of pastel colors--white, green, pink, yellow, lilac and blue. Description: Cool mint center surrounded with chocolate and sealed inside a colorful candy shell. 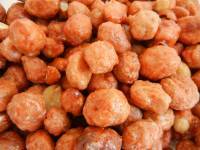 Description: Our Boston Baked Beans are the same old-fashioned sugar coated peanuts you remember eating as a kid! 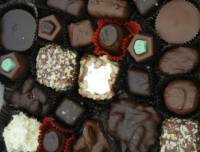 Description: An assortment of our best-loved handcrafted chocolates. Milk and dark chocolates in a beautiful gift box. Your choice of 1/2 lb. or 1 lb. Description: These beautiful handcrafted chocolates are so rich and delicious that you won't miss the sugar. Already packed in a 1/2 lb. or 1 lb. gift box, they make a lovely hostess gift. Description: On old-fashioned favorite, burnt peanuts are toasted peanuts covered with a red candy shell. A sweet & savory treat! Description: Traditional after-dinner mints that melt in your mouth, leaving a fresh minty aftertaste. Description: 16 oz. - Butter Toffee Peanuts. Each peanut is coated with sweet, buttery toffee for a scrumptious treat. 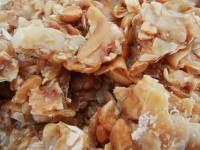 Butter Toffee Peanuts 8 oz. Description: 8 oz. - Butter Toffee Peanuts. Each peanut is coated with sweet, buttery toffee for a scrumptious treat. 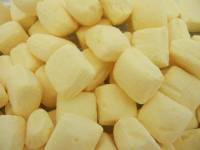 Description: Especially popular during the fall, the triangle-shaped candies have a vanilla-marshmallow taste and chewy texture. This Halloween classic is available all year long. Cashew Brittle with Coconut 12 oz. Description: This traditional brittle candy is loaded with cashews and coconut. 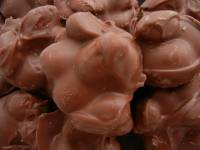 Chocolate Almond Clusters, Dark 8 oz. 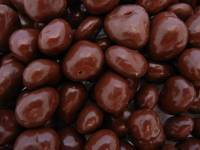 Description: Clusters of premium almonds covered in rich dark chocolate. 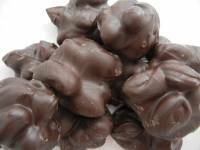 Chocolate Almond Clusters, Milk 8 oz. 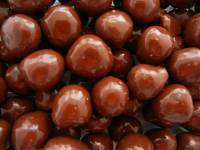 Description: Clusters of premium almonds covered in creamy milk chocolate. 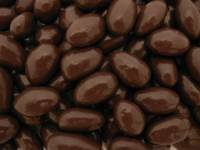 Chocolate Almonds, Dark 8 oz. Description: California almonds covered in dark chocolate. Chocolate Almonds, Milk 8 oz. Description: Premium almonds covered in creamy milk chocolate for a classic taste. 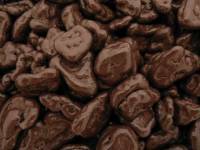 Chocolate Banana Chips 8 oz. Description: Bite sized banana chips smothered in milk chocolate. 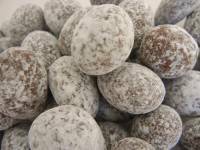 Description: A delicious combination of nuts and fruits covered in dark and milk chocolate. Raisins, peanuts, almonds, cashews, and nougat make up this unique blend of old fashioned favorites. Chocolate Mini Caramels 10 oz. Description: Bite-sized caramels covered in milk chocolate. 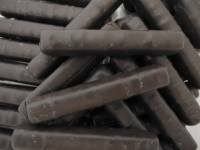 Chocolate Orange Sticks, Dark 10 oz. Description: Sweet orange jelly candy sticks covered in dark chocolate. 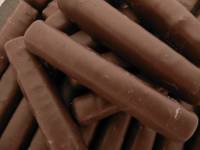 Chocolate Orange Sticks, Milk 10 oz. Description: Sweet orange jelly candy sticks covered in milk chocolate. Description: Peanuts and milk chocolate--a classic combination! 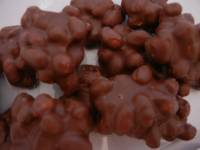 Chocolate Peanuts, Double Dipped 12 oz. Description: Jumbo peanuts dipped not once, but twice in creamy milk chocolate. 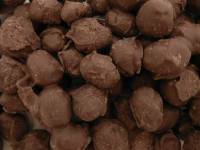 Chocolate Peanuts, Double Dipped 7 oz. Description: Bite-sized pieces of creamy milk chocolate covered with a crunchy candy shell. 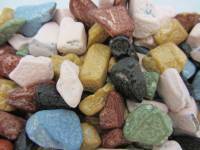 They look just like pebbles, but taste MUCH better! 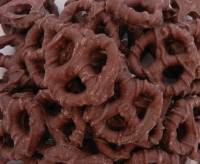 Description: Crunchy mini pretzels dipped in creamy milk chocolate. 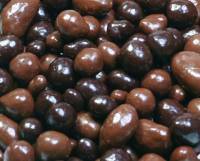 Description: Juicy raisins covered in creamy milk chocolate. 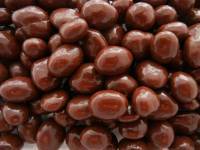 Chocolate Toffee Almonds 8 oz. 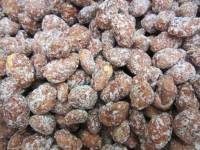 Description: Premium almonds covered in milk chocolate toffee, finished with a light dusting of confectioner's sugar. 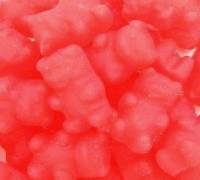 Description: Sweet and slightly hot, these chewy little bears are bursting with cinnamon flavor. Description: Tiny cinnamon candies with a punch of red hot flavor. 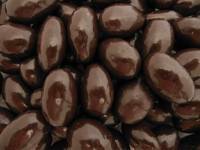 Dark Chocolate Coffee Beans 6 oz. Description: Dark roasted coffee beans covered in rich dark chocolate for a classic treat. 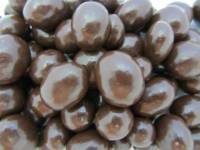 Dark Chocolate Drops 16 oz. 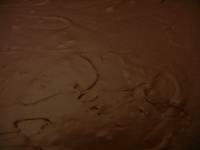 Description: This dark chocolate candy melts to a creamy smoothness for easy handling. Use it for dipping fruits, nuts & snack items, decorating desserts, and molding candies. Dark Chocolate Sea Salt Caramels, 6 oz. Description: Rich, chewy caramel surrounded by creamy dark chocolate and finished with light sea salt flavor. Sweet & savory...pure indulgence! 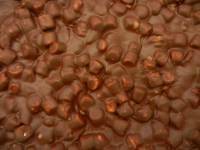 Description: Buttery toffee covered with chocolate and almonds for an old-fashioned treat. Description: Eucalyptus Chips offer natural relief for a dry, scratchy throat. 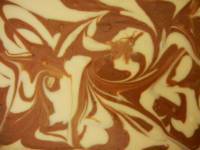 Description: Creamy coffee-flavored fudge swirled with vanilla fudge and finished with light dusting of cinnamon on top. 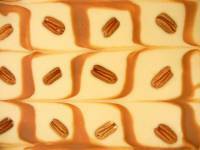 Description: Layers of vanilla fudge, praline, and caramel, topped with beautiful swirls of flavor. 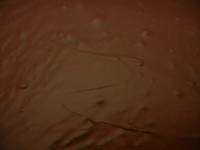 Description: Classic chocolate fudge. No nuts, no extras. Just creamy, rich chocolate fudge. Simply delicious. 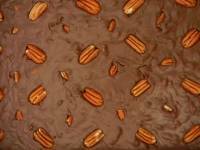 Description: Chocolate fudge blended with premium pecans. Description: A classic…chocolate fudge with walnuts. Description: Classic dark chocolate fudge. Simply delicious. 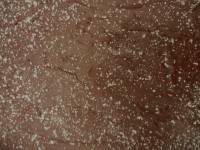 Description: Rich, dark chocolate fudge coupled with buttery caramel and topped with coarse crystals of sea salt. A harmonious blend of textures and flavors. 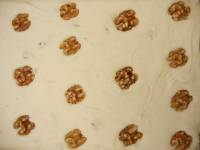 Description: Delicious candy nougat with nuts. It's heavenly! Description: A taste of fall! 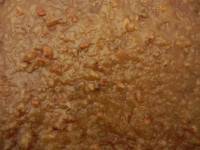 Creamy vanilla fudge blended with maple & walnuts. Description: Chocolate fudge blended with mini-marshmallows and walnuts for a classic rocky road treat. Description: Chocolate Fudge layered with a slab of caramel and peanuts. It compares in taste to a Snickers® candy bar! Layers of fudge, peanut slab, fudge and caramel swirl, with crumbled candy on top. Description: Layers of coconut pecan frosting and chocolate fudge. 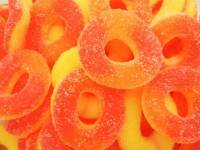 Gummallo Peach Rings 12 oz. Description: Slightly tart and very sweet, these peach rings have a burst of peach flavor in every bite. 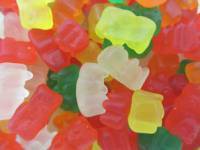 Description: Who doesn't love gummi bears? These soft and chewy candies are colorful and full of fruity flavor. Description: Pucker up! Gummi bears with a sour twist. 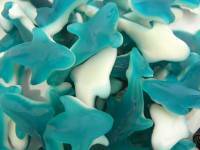 Description: Gummi Sharks are colorful and chewy. 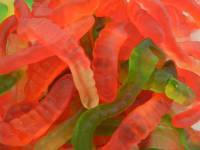 Description: These fun gummi candies are shaped like worms. Gummi Worms, Sour 10 oz. Description: Do you like sour gummi worms as much as we do? 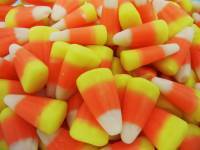 They are the perfect blend of sweet and sour with a slithery gummy texture. Description: An assortment of fun fruity flavors and bright colors. As pretty as they are delicious! Description: A classic mix of fresh, soft, and sweet licorice that originated in England. There is an assortment of colors and shapes in each bag, all with good old fashioned licorice flavor. Description: Chewy licorice centers covered in pastel-colored candy coating. Description: Your favorite black licorice twists! Licorice, Black Jelly Beans 12 oz. Description: Are you a black jelly bean lover? 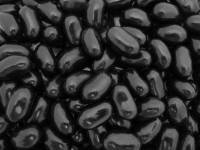 We know that you are out there, and you are sure to love OUR black jelly beans! This bag has ONLY black jelly beans...not a fruit flavor in sight. Licorice, Black Kookaburra 10 oz. Description: Aussie style black Kookaburra licorice is known for its soft, chewy texture and full licorice flavor. Delicious! 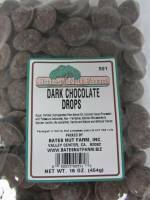 Shipping Note for chocolate and homemade fudge products shipped during summer months: Bates Nut Farm ships our products boxed in shredded paper for insulation and stability. Our food products are stored in refrigerated or air conditioned environments prior to shipping. We cannot guarantee that your package travels in the same temperature controlled environment. 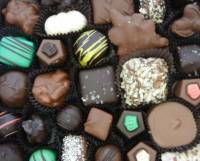 WE DO NOT RECOMMEND SHIPPING CHOCOLATES OR FUDGE DURING THE HOT SUMMER MONTHS!